Happy day! Though I am not sure - perhaps lacking a charm that Kate's quilt has - hopefully it has a mood of its own. I am so pleased to have it finished, such a simple quilt, but quite a marathon effort for me. I think it will be quite a while before I sew a full sized quilt again - maybe never. I am just so thankful I can still do handwork - I am going to have another try at clamshells again and also a little play with applique. I'm so looking forward to having it quilted. Hope your day is happy, too! Hi Lurline, I think you do yourself a dis-service. The quilt is gorgeous. So light and fresh and to me every bit as charming as Kate's. Very pretty! I love how it came out. Looking forward to seeing it quilted. Gosh I love that so much!! 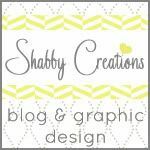 Clean, bright, simple, pretty!! Lurline it will be beautiful with the quilting done you just wait. Glad you are doing a bit and hopefully r feeling better soon. I love it Lurline! Like you said, simple! 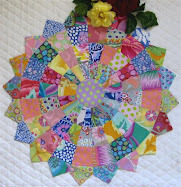 But the quilting will add a whole new dimension to it and make it even more lovely! How fresh and gorgeous it it! Will you quilt it yourself ... in time? That is so fresh and lovely looking. keep at it and hey we love applique so prep a block and start! This lovely quilt will be so wonderful when done. The simple design enables the quilter to embelish at will! I love it Lurline ... don't be so hard on yourself ;o)!!! Those colours are lovely and fresh and light - so pretty :o)! It's wonderful, so fresh and crisp! I know you're a whiz kid, but I just figured out what works for me with the clamshells so give me a shout if you wish. I love it! Very simple and clean looking. I have been working a lot with white backgrounds lately, and I think they will always be in style. Oh Lurline this is so lovely, so simply and quite smashing! It will surely take the quilting with delight, wont it? Enjoy the clamshells. I've made quite a bit of progress on mine but I my method (inklingo) is both simple and difficult. Have to use my brain which I'm not always a fan of. Using my brain I mean... Warm and sparkly hugs, *karendianne. I like this simple quilt. Fresh and clean. You did a great job! Hello Lurline...I was checking in on you today and finally catching up on some blogging. 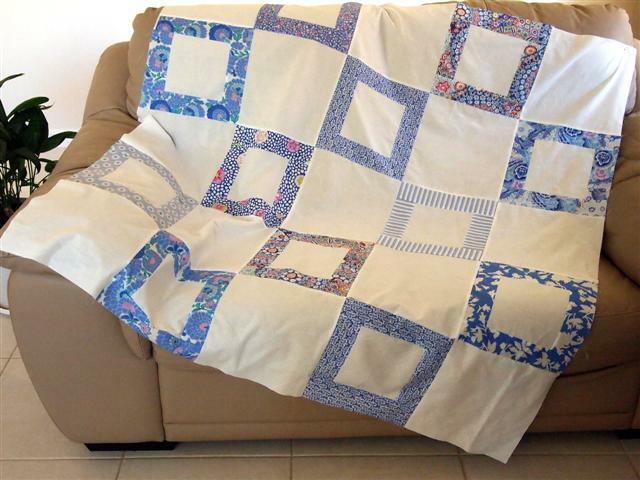 I think your blue and white quilt is so REFRESHING! Just seeing it makes me think cool and crisp. Job well done you!! Very pretty. I like the simplicity of it. Simple is best sometimes isn't it. It's such a classy quilt! You did a wonderful job! Love the Freshness of this quilt...will be lovely quilted..
Hi Lurline, looks so fresh and gorgeous..I love blues and whites.. I love the quilt Lurline and it will really come to life once it's quilted. Oh do I see some Kaffe's fabrics in there.....looks so crisp and blue is my favorite color. can't wait to see it quilted....its a real keeper. Happy sewing however you can manage it......hand sewing is zen and peaceful. So pretty! I love the white and blue combination, it just looks so fresh to me. I don't know about that, Lurline.....once it's quilted, I think Kate'll have a challenge on her hands!!! I think it looks fantastic! Hi Lurline, I just stopped by to say "hi" and wish you a lovely weekend. This quilt is very sweet.